I spent most of last year with the privilege of editing a fine book by Chuck Swindoll, released just last month, The Church Awakening: An Urgent Call for Renewal. The book contains all that we’ve come to love and appreciate about Chuck’s writing—humor, biblical accuracy, practical insights, grace, and balance. In a nutshell, the book looks at how the 21st-century church has drifted away from biblical beliefs and essential truths has produced many local congregations and leadership devoted to entertaining the flock rather than to feeding them. By examining how God’s Word defines the church’s priorities, Chuck takes us beyond a mere analysis of today’s church to the needed encouragement of how leaders and congregations can play a part in returning to God’s design. Full of great illustrations, humorous stories, and practical Bible teaching, The Church Awakening is a must-read for pastors and church leaders—as well as any serious-thinking Christian. The chapter on worship alone is worth the price of the book. I am confident you’ll enjoy it! You can pick up a copy from Amazon or from Insight for Living. 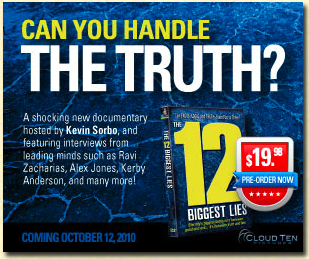 I also had the privilege to participate in a brand new documentary project called “The 12 Biggest Lies.” The documentary is extremely well produced and features interviews from “leading minds such as Ravi Zacharias, Alex Jones, Kerby Anderson, and many more!” (I’m part of the “many more” group.) You can see all the contributors here. By the way, I don’t make a dime off this project or from my endorsement of it. It was just a privilege to contribute. You can watch the trailer below and order the DVD from Amazon or from the Cloud Ten Web site.